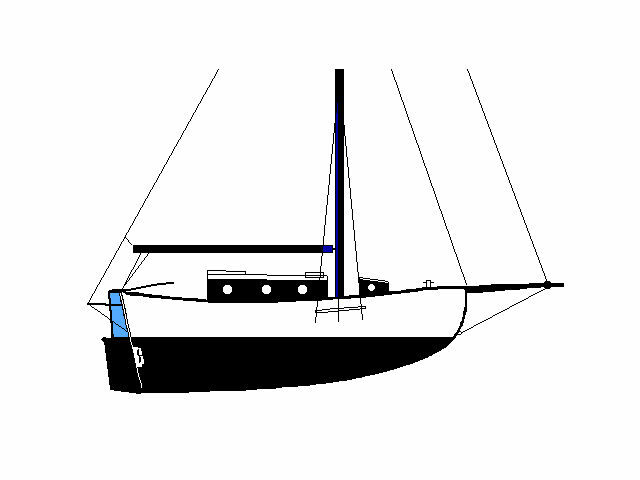 File S/M-22, obtained from Roger Olson, Costa Mesa, CA - Vessel name Xiphias, hailing port Los Angeles, Bristol Channel Cutter, designed by Lyle Hess, LOA 37' (with bowsprit) x LWL 26' x Beam 10' x Draft 5' x 7 Tons - Full keel - Sea anchor: 12-ft. Diameter BUORD on 300' x 5/8" nylon three strand rode and 20' of chain with 5/8" galvanized swivel - No trip line - Deployed in hurricane Tia in deep water approx. 25 miles off the Queensland coast near Bundaberg with winds sustained at 60 knots and seas of 30-40 ft. - Vessel's bow yawed 45° - Drift was estimated to be about 5 n.m. during three days at sea anchor. I was lucky to only catch the edge. There were two hurricanes at the same time. On WWV I heard that a hurricane was approaching our location but there was too much interference to hear the exact coordinates. I used the ham radio to call New Zealand. A ham operator informed me that it was north of us and heading away. I wasn't aware that this was a different storm and that we were heading into the original one. As the weather deteriorated I ran off with storm jib and storm trysail. I considered dropping the trysail but wanted it up in just case I decided to heave-to. Deployed two "MINI" tires [makeshift drogue] off the stern for better control. Wind and seas not too bad (40 to 50 knots) and it was going in my direction. A huge wave broke next to us, depositing ample amounts of water on me and filling the cockpit. It doesn't take a genius to realize that if the wave had been over the stern I would have been rammed against the flat aft side of the cabin. Also, I could easily imagine this wave carrying me to the end of my harness tether. If the tether didn't break it would surely break my ribs. So I decided to come about and heave-to. I had to cut the drogue loose to come about. The boat set well for several hours but as the wind and seas increased it was apparent there was too much sail area up. So I dropped the storm jib onto the staysail stay and remained hove-to on storm trysail. Never expected it to get this bad or I would have used the parachute anchor. It was in the lazarette and my rope was still shackled to the anchor chain and anchor, all lashed forward. There wasn't a snowball's chance in hell that I was going forward in those winds and seas to unlash it, undo the shackle, etc. I went below to get out of it. My hand-held wind indicator could only register 60 knots and it was at the maximum. During the night I knew my storm trysail was too much because the boat would heel severely on the crest of the wave. As the boat entered the trough she would change her set so when she got the full force of the wind on the crest the sail would flog and it seemed like it would rip the boat apart. Then it would fill and we would heel to the extreme. There was only one knockdown, which was when everything came out of the lockers and drawers, burying me under cans and boxes. So much for the "slick!!" During the night it began to improve until I was able to sail by late the next afternoon. Australian radio stated that the Tropical Storm was strengthening to cyclone strength in the South Coral Sea and was heading south. This time I was better prepared. I had disconnected my anchor from my 5/8" nylon rope and pulled it all on deck. I tied the bitter end to the sampson post, leaving about 10 feet for freshening the nip. I had already run the rope through a fairlead on the bottom of the Cranse Iron (this is how I anchor anyway) and led the rest aft to the cockpit. Where the rope led through the fairlead I had sewn on a meter of leather for chafe. This was set so the leather just passed through the fairlead so I could let rope out to "freshen the nip" if necessary. (Later I never checked for chafe because I was too frightened to go forward). I led the rope along the top of the life line and lashed it in place with fine nylon thread (dental floss would work) and to the cockpit where I coiled it and used stops to hold the coil in place. The parachute anchor was kept in the lazarette. I already had added about 25 feet of 5/16" chain to the end of the swivel attached to the parachute. I removed the parachute anchor, chain and swivel as a unit in a bag. Using a bowline with a double wrap, I attached the rope in the cockpit to the swivel. I deployed the parachute early while I was hove-to. From the cockpit I deployed the float (enough buoyancy to float the chain and anchor on 20 feet of rope attached to the center of the crown of the parachute) over the windward side. This was followed by the parachute anchor, chain and rope. The boat was making slow leeway so I was able to maintain complete control of the rope until all (300' + 20' chain) was out. As I let go of the rope it broke the thread along the life line until the boat was riding bow to the wind and seas. I dropped all sails and went below. I remained below for the better part of three days. I still don't know the strength of the winds as my hand-held indicator wasn't working properly - it was stuck at 60 knots. The boat did tack in this position. In the trough there was little pull on the parachute anchor and the boat would set up to 50° from center. As she neared the crest more tension would be put on the rode, pulling the vessel straight. I had substantial water overboard because I was making little or no sternway. This was proven by feeling the pressure on the tiller, which I had lashed amidships. I was concerned about damage to the rudder if I made too much sternway. I don't know the amount of drift in those three days, nor do I know the current. After the worst was over I finally got permission to put into an illegal port of entry (Mooloolaba, Qld). I set my course based on my last known position and allowed about five miles for drift. I was sailing entirely on celestial navigation and didn't have GPS or SatNav. I used my RDF to take a rough bearing and set a course for Mooloolaba. As I approached land I found my DR wasn't far off. Comments: With the parachute anchor I never really felt in danger. Deploying it from cockpit worked great. I can't believe anyone would go forward in storm conditions to work anything on the foredeck. There was some chafe on the leather but it never wore through to the rope. I never adjusted it in the three days, but it was apparent that there was about one foot of stretch on the leather. I spent all my time inside during this and other storms. Only when conditions were not life-threatening would I go forward to inspect for chafe or damage. 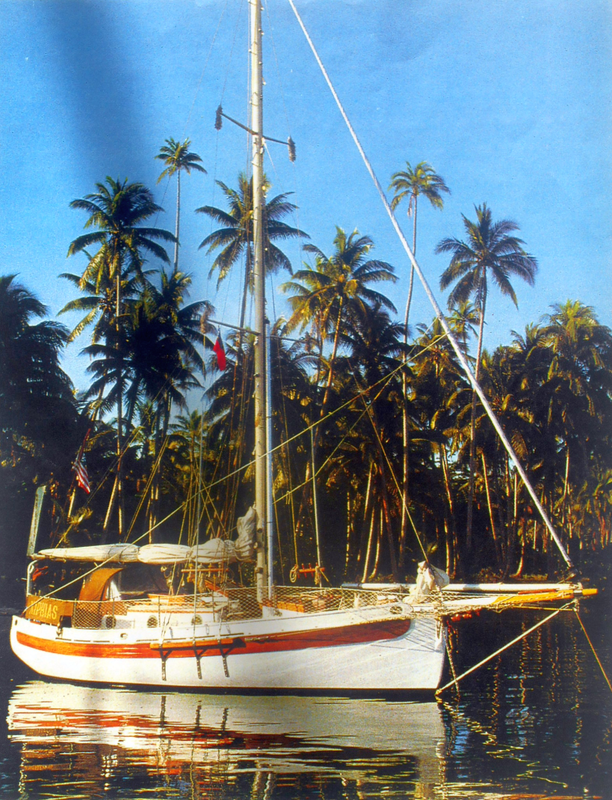 I had everything strongly lashed down, including my dinghy on the foredeck. The only things I lost were two 5-gallon fuel containers which were lashed with old 1/4" rope. Roller furling jib remained on the headstay - not recommended as it creates considerable windage. I had rolled it up tightly and pulled the sheets as tight as I could so the headstay wouldn't flog. It still shook the boat more than I thought it would. I don't know what I would have done had it unrolled. I should never have been sailing in those waters during the hurricane season. However, in both cases I was rushing to meet my girlfriend... wasn't worth it!